Roseville Model Trains. Many people think of them primarily at Christmas. You know. You buy the kids or grandkids a cute train to go around the Christmas tree. But did you know there are plenty of people who enjoy trains and train layouts all year long? 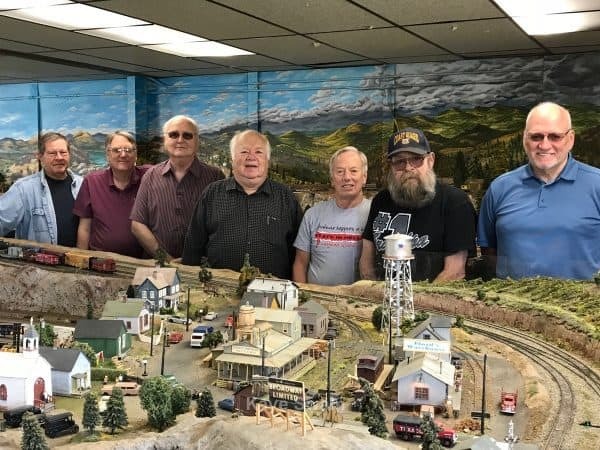 Several in my family have enjoyed model railroad-ing including one of my uncles as well as my sweet husband. In fact, my husband was a mega HO model train fan from childhood on. (HO is one of several letter codes to represent the size of the model train. HO is one of the most common sizes you see.) He had a large board – bigger than a door – with mountains, trees, buildings and lots and lots of train tracks to run his model trains on. Kind of like a miniature version of what you see in the photo below. Model trains are a fun hobby for all ages and many enjoy it here in Roseville CA, including in Sun City Roseville. Not only that! We even have a large Model Railroad group right here in Roseville. 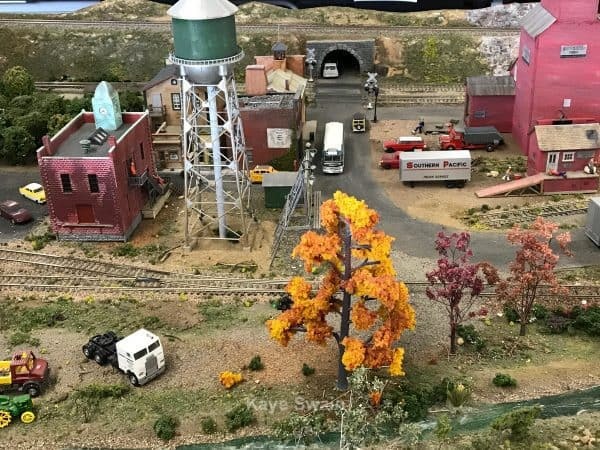 The Roseville Roundhouse Model Railroading Club is alive and well with several active members and huge layouts that are a delight to see (like the photo above and below – plus you can see more photos at my facebook page – @RosevilleCaliforniaJoys. 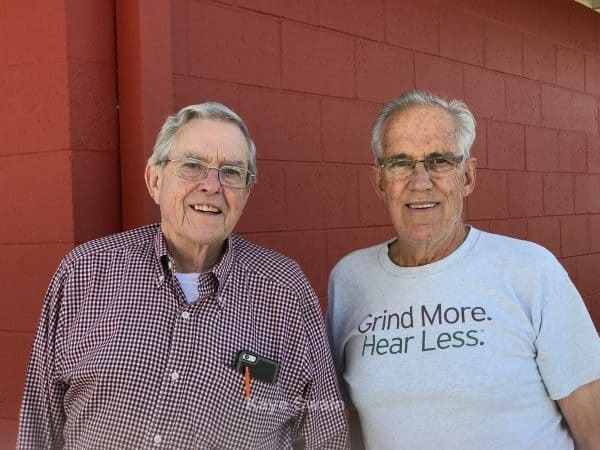 They meet regularly at their headquarters which is currently located in the newly remodeled Placer Fair Grounds, recently renamed @The Grounds. The Roseville Roundhouse Model Railroading Club is always one of my favorite places to visit when I go to the Fair Grounds – @The Grounds! We’re probably going to be heading there in May for Berry Fest and will definitely be popping in. When I do, they are always busy with visitors of all ages enjoying the trains and the cool layouts – from young kids on up to senior adults and everyone in between. 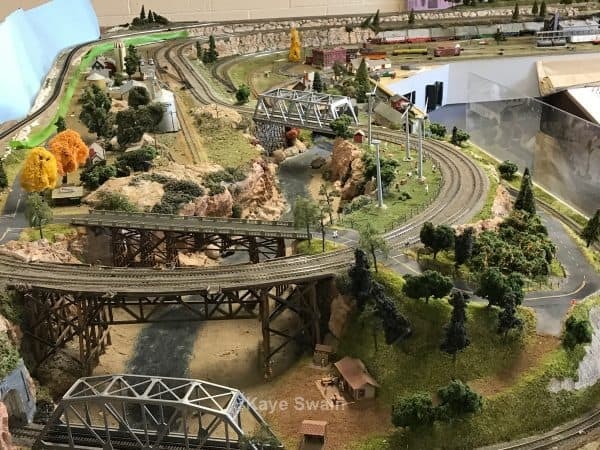 Model train collectors enjoy this fun hobby throughout the country and there are even model train fairs and conventions that meet in various locations all across the U.S. You can usually find several model train shows in California each year. Some of those are actually hosted locally with either a model train show in Roseville most (all?) years as well as a model train show in Sacramento in various years. Very cool! They are popular enough they even make it on our local news shows! Doubly cool! We have at least a couple of model train shows coming up over the next two years. The annual International RailFair should once again be coming to Roseville at the Placer Fairgrounds sometime in November. 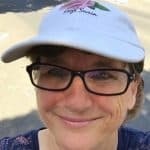 “For the past 40 years this show has not only been a huge success but continues to grow thanks to the combined effort of these four model railroad organizations: Sacramento Modular Railroaders, Roseville Roundhouse Model Railroad Club, European Train Enthusiasts and the Sierra Division of the National Model Railroad Association. Together they work throughout the year planning and researching to ensure the show gets better each year.” This is a family friendly and affordable outing for all, and especially for fans of model trains in ho scale and more! Also, the 39th National Narrow Gauge Convention will be in Sacramento CA September 4-7, 2019. Model Train Sets Make For Family Friendly Activities! Building model train layouts can be fun for the whole family from young kids and grandkids all the way up to senior grandparents. My kids enjoyed helping their dad build things. He and I had fun meandering through various hobby shops together looking for fun items like HO model train engines, lovely scenery, and more. Plus if you add a dollhouse on the side, it can make for fun times even with the tiny ones. 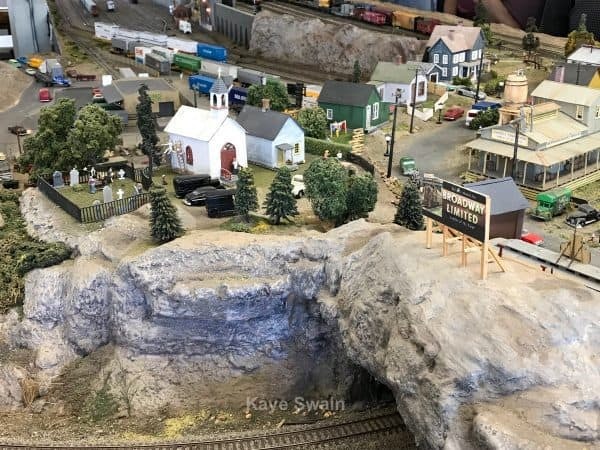 Model train collectors find their treasures in a variety of places. Many enjoy visiting yard sales and rail fairs to look for used equipment. Others hightail it to various hobby stores. My husband loved to while away time at Railroad Hobbies at 119 Vernon Street in Roseville. 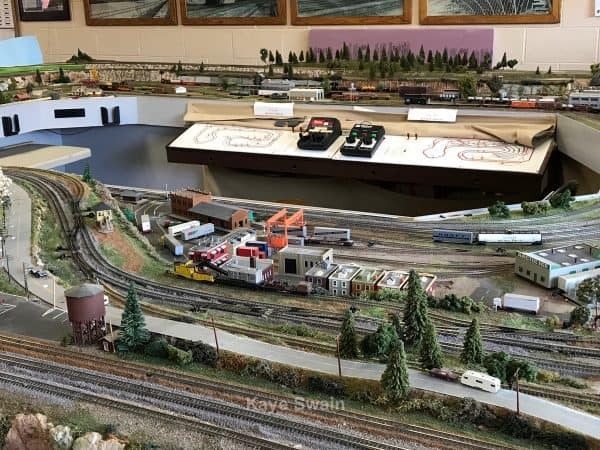 This is one of the few model train stores in Northern California and it is fully dedicated to model trains with model trains for sale as well as model train accessories. Hobby Lobby is another great resource. And, of course, don’t forget to check out Amazon. I bet regularly checking estate sales is a good option as well. Whether you are collecting model train sets and accessories or just have fun buying a few for your kids and grandkids to have fun with, these definitely make for great memories and fun family friendly activities at home and at train shows. 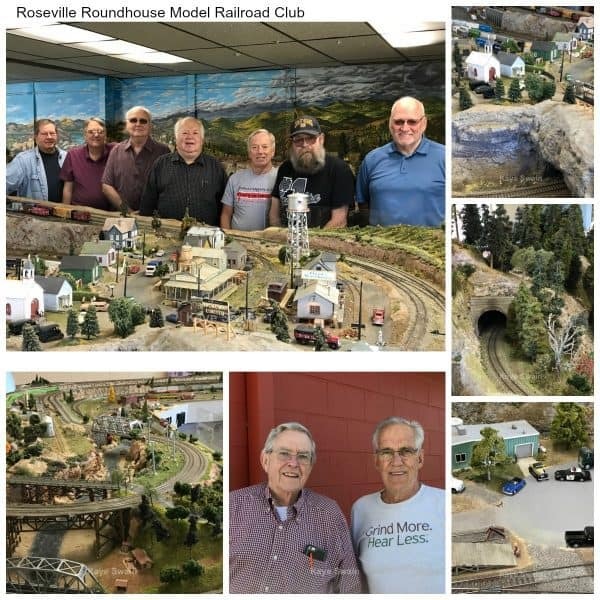 And the Roseville Roundhouse Model Railroad Club is doing a grand job of helping to keep the spirit of model train collecting alive and well here in Roseville California at the Placer County Fairgrounds. They are also online at RosevilleRoundhouse.org as well as on Facebook at Facebook.com/rosevilleroundhousemrc. P.S. If you ever have any model train equipment you no longer need, or perhaps one of the seniors in your family is downsizing and has some items to share, the Roseville Roundhouse Model Railroad Club will gladly accept those donations, as well as cash donations. It’s a great way to keep the train spirit going on and on and on…. 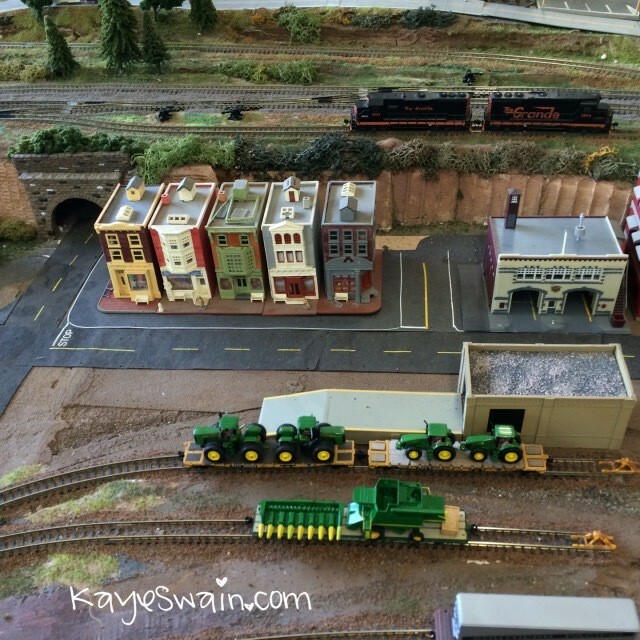 6 Model Train Sets Make For Family Friendly Activities!